For many years I have carried a smal, slip joint folding knife nearly every time I’ve left my house. I use it for small jobs virtually every day. My requirements for this type of knife are that it should be very close to three inches long (closed), have two blades and be fitted with attractive handle scales. For me, these are the attributes of a true everyday carry (EDC) knife. In the past, I have mostly favored the Buck Companion and Case Peanut patterns for a small “dress knife.” However, now I’ve tumbled to the Case Mini Copperhead. Blade pattern/length: Wharncliffe, 2-1/4"; pen, 1-5/8"
There are few surprises when one buys a conventional folding knife made by Case. Most models feature Case’s Tru-Sharp stainless steel blades, accompanied by nickel silver bolsters and brass pins and liners. 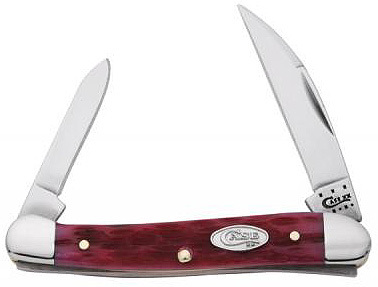 Case uses a variety of natural and synthetic materials for handle scales, with dyed and jigged Zebu cattle bone being the most common. I have never seen a Case knife that had poor fit and finish. Besides it’s overall size (3-1/8 inches), there were two features that attracted me to the Mini Copperhead. First was the Wharncliffe main blade. I most frequently use a small pocket knife to open letters and packages and tease splinters out of my hands. (My hobby is rustic woodworking.) The sharp, straight tip of a small Wharncliffe blade is excellent for these and similar small chores. However, the Mini Copperhead can also be had with a clip main blade, if one prefers. Either way, there’s also a handy pen blade. The fit and finish of my knife is what I expect from Case, i.e., very good. All parts fit together tightly and smoothly with no irregularities. The polished, flat ground blades came with a good factory edge, but I knew from experience with Tru-Sharp steel that it could be a bit better. I honed the blades on crock sticks, which quickly brought the edges to total sharpness. Some steel freaks criticize Case Tru-Sharp. True, it’s not the world’s most advanced or exotic blade steel, but I have never found it wanting for the light to medium duty tasks I do with a small, slip joint folder. At Rc 54-57, the edge may dull a bit quicker than harder blades, but this doesn’t bother me, because it’s easy to sharpen. I keep the Case Mini Copperhead in a tray on my dresser, right by my keys and wallet, ready to be dropped in a pocket when I go out. The Case Mini Copperhead is made in the U.S.A. and can be bought at 25 to 30 percent discount from MSRP. Copyright 2014, 2016 by Gary Zinn and/or chuckhawks.com. All rights reserved.